My husband was surprised when he took the cover off our gas grill on Memorial Dad to find a tiny frog on the shelf where he usually sets the plate of food to be grilled. It seemed completely oblivious to being exposed at first. I rushed out with my camera to get some pictures. It didn’t budge. We wanted to turn the grill on so I used a dandelion leaf to tickle the frog and it jumped….but in the direction it was pointed (which happened to be toward the grill rather than away. I tried again, and the frog jump off the grill and hopped a few times to get to a vertical surface – the frame of the door to the covered part of our deck. Note that the color seems a little different; the reference I found said that this type of frog could change color based on its environment. It’s a Tree Frog. We have two in this area that look identical – the eastern gray tree frog (Hyla versicolor) and Cope’s Gray Treefrog (Hyla chrysoscelis). 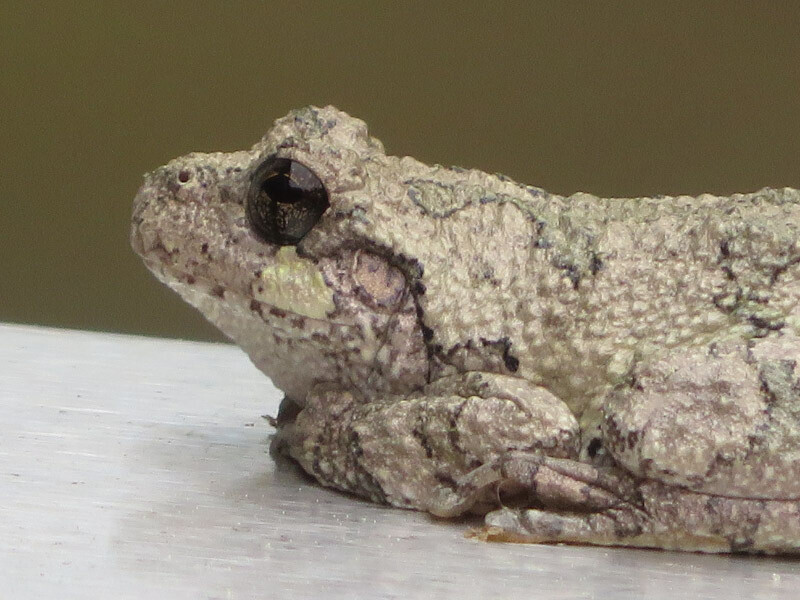 The only reliable way to distinguish is evidently the number of chromosomes (Cope’s Gray Treefrog is diploid, the eastern gray treefrog is tetraploid). This individual did have a light spot beneath the eye and large toe pads typical of both.